Home › Health › Are we done with invasive long needles for prenatal diagnosis!? Traditionally, a long needle would be introduced through the skin of the abdomen all the way through the muscle layers of the abdominal wall and the uterus, then through the protective membranes to reach the water surrounding the fetus to obtain a sample that we would test for genetic abnormalities or mutations. 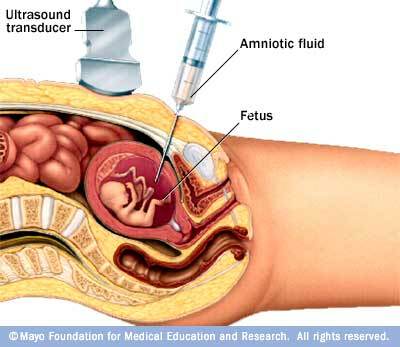 This process is called Amniocentesis. 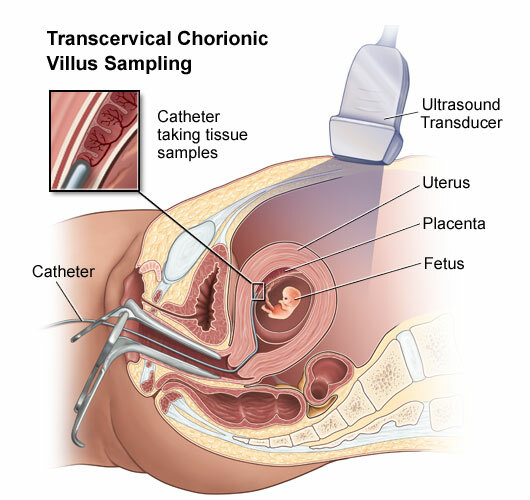 Chorionic Villus Sampling or CVS is a similar procedure except that it is done at an earlier gestational age and is associated with higher risks. Both CVS and amniocentesis are used to obtain fetal cells that would aid in performing conventional karyotyping (Mapping and counting of the chromosomes) that would help with prenatal diagnosis of genetic diseases. Chromosomal microarray analysis or CMA is a novel method that appears to be superior to karyotyping. CMA analyses chromosomes for a large number of genetic disorders. In addition to what karyotyping can usually detect, CMA detects copy number variations (deletions and duplications) that are beneath the radar of conventional cytogenetics. As an example, CMA detects genomic imbalances in up to 15% of children who otherwise were deemed to have “unexplained congenital anomalies,” in 6% of fetuses with ultrasonically detected structural abnormalities but normal karyotypes and in 2% of fetuses with normal ultrasound findings and karyotypes. CMA does not require the relatively lengthy, uncomfortable and invasive procedure to obtain a sample. 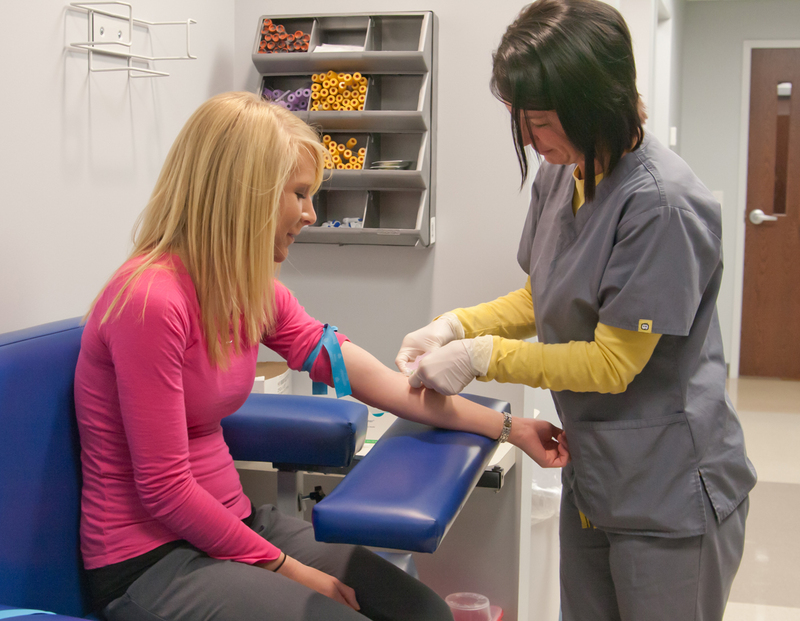 It only requires a regular blood sample like one would give when a blood test is requested. The test is not perfect. CMA might detect a genetic abnormality for which there is currently very little medical information available to predict the type of clinical problems that may develop in an individual. This is due to the phenomenon of copy number variants of unknown clinical significance, which occurs in 3% of cases. This uncertainty might be very distressing to patients and families. In addition, CMA cannot detect all cases of mosaicism, balanced translocations, or inversions. Karyotyping might be used to supplement CMA. It is of utmost importance that the physician discusses at length the risks, benefits, alternatives, and indications of this test with the patient or to refer them to a genetic counsellor. In women who choose to undergo invasive prenatal diagnosis, if at least one major fetal structural anomaly has been ultrasonically diagnosed, CMA should be performed instead of karyotyping. In women with no fetal structural abnormalities who choose to undergo invasive prenatal diagnosis, either karyotyping or CMA is appropriate. CMA should NOT be limited to women aged ≥35 since the anomalies detected do not correlate to maternal age. If fetal demise or still birth has occurred and cytogenetic diagnosis is desired, CMA is the method of choice. An informed consent should always precede the test and should include a discussion of findings of uncertain significance, consanguinity, nonpaternity, and adult-onset disease. Genetic counseling is required before and after the test. Do NOT use use CMA to evaluate pregnancy loss neither for 1st nor 2nd trimester. Interesting. Good advertisement. Yeah, advertisement. Informed consent? Even pre-official-informed-consent? No, no, no. Pain? Risk of miscarriage? Can husband/father be present? What about risk of malpractice suit? And, note the “uncomfortable” comparo to standard amniocentesis. Interesting how these words are placed so carefully to steer patients toward the newer procedure. Well, is the newer procedure “uncomfortable” as well? The sacrifices pregnant women and their partners must make.